-balance in the design, not only left to right or top to bottom but if there are more than one of a shape then are both the same size ,same curve etc…? -Are there any sharp ends where the line wasn’t finished well? Have the lines been buffed out with too much polishing and rounded the top edge of the cut ? -If buying Sterling Silver there should be a stamped image on the piece to indicate ‘ Ster’, or ‘Sterling’ or ‘.925’. -The ‘.925’ indicates that it is 92 1/2% pure silver. The other 7 1/2% could be combinations of copper ,zinc , nickel , tin or ‘whatever’. -There should also be a stamp to indicate the karat quantity, such as 10k ,14k,18k ,22k or 24k. If there isn’t a stamp the item may be gold plated on top of copper, silver or another base metal. -If you don’t have an ultrasonic cleaner it is still possible to get the dirt out and a lovely shine back on your jewelry. by using a store bought cleaner and following the directions but if you want a quick ‘home remedy’ method a soft cloth or a toothbrush, (preferably an old one ), and dish soap or toothpaste will also do the trick ,but read the cautions below carefully. -Dirt inside all those little areas can also be beaten at home If the item is just gold or silver and/or a diamond then you can heat the jewelry in a glass container on the stove in water and dish soap. Don’t bring it to a boil but just get it warm/hot and clean the crevices with the toothbrush. should be taken when applying heat. Although you are dealing with ‘rocks’ most are not very forgiving. To be safe you should not heat any stone except diamonds-Soaps should not be used with : Amber,Iolite,Opals,Pearls or Peridots-Cleaners should not be used with Amber,Coral,Emerald,Iolite,Opals,Pearls, Peridots,Tanzanite,Topaz or Turquoise. Steam and Ultrasonic cleaners can be used with Alexandrite,Diamonds,Ruby, Sapphire, Spinel ,and Zircons. If in doubt a professional jeweler would obviously be your best bet for your precious and possibly irreplaceable item. it to us or wrap a piece of paper strip, ( about the width of a pencil ), around your finger and mark that as well. For bracelets do the same, measure your wrist loosely and then minus 1/2″,( 1 cm )for the proper bracelet size. Precious and semi-precious stones come in many different classifications which increase or decrease the value. Just like buying a car..type is important but if it’s damaged the value decreases Diamonds adhere to the 4 c’s regulated by the GIA, Gemological Institute of America. 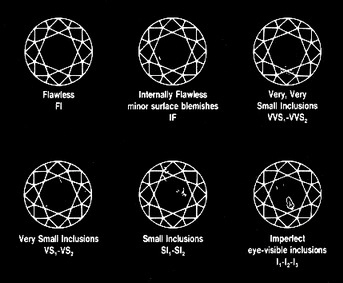 -IF – internally flawless -insignificant flaws under 10x magnification-VVS1 & VVS2-very very slight inclusions, difficult to see under 10x magnification. -SI1 & SI2 – slightly included -noticeable under 10x magnification but still clean to the naked eye. 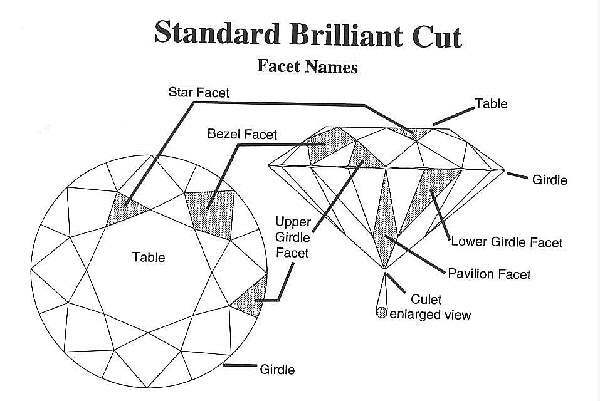 Larger stones generally cost more per carat due to their rarity.